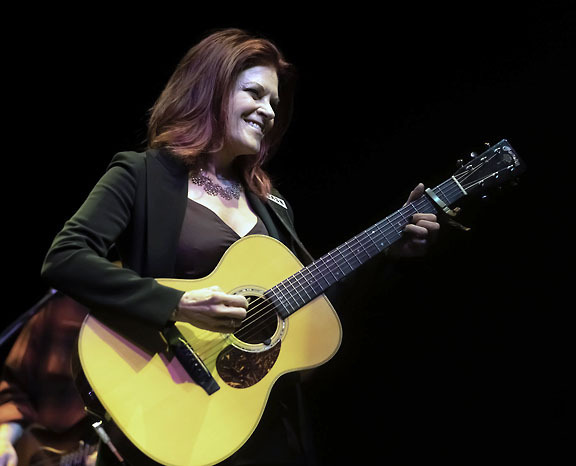 Rosanne Cash made her third appearance in Tucson and her appearance is much like seeing a welcomed old friend once again. This was touted as the last stop on her "She Remembers Everything Tour." However she is back on the road in March. Midway through the performance, Cash mentioned, "I love your native daughter Linda Ronstadt. She has been a tremendous influence on me. I spent 15 years trying to make a record as good as "Heart Like a Wheel." It's a thrill to be playing in her home town." 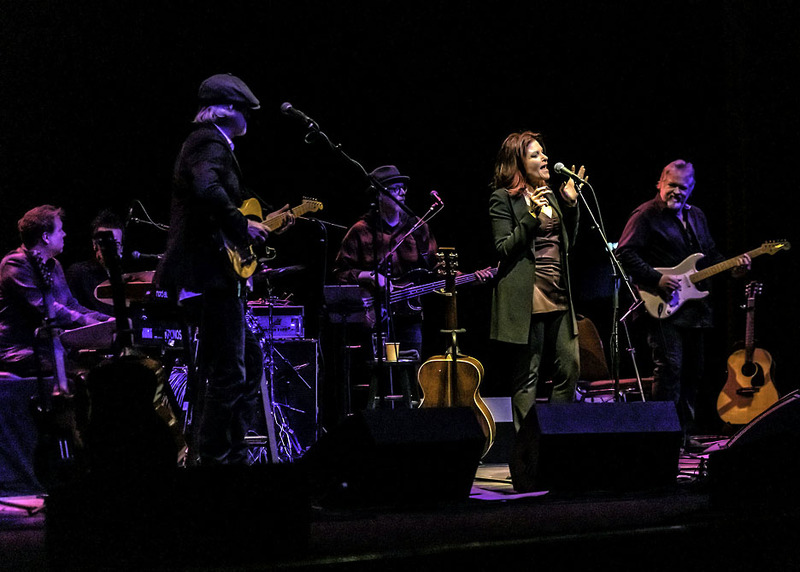 The singer/songwriter's show was a blend of self-penned and cover songs that represent Americana music at its best. Cash is the eldest child of the late country legend Johnny Cash. The iconic elder Cash has more than 90 million record sales. He wrote about themes of redemption, sorrow, and troubled human condition. Those themes are the root of Country, Blues, Gospel, and Americana Music. His daughter has developed her father's propensity for story telling in her writing and delivery in her live shows. In certain instances, she has surpassed her father. She is very willing to share her heritage. Cash seems to reach back in her family history for inspiration in writing her songs. Cash revealed when introducing "The Sunken Lands," "A lot of these songs were set in the Delta, known as an area of the Delta called the 'sunken lands of Arkansas.' It's called the sunken lands because of an earthquake in 1809. The land is where the Mississippi River actually sank up to 50 feet in some places. The Mississippi river actually went backwards for three days. You could feel the tremors in New York City. One hundred fifty years later, FDR, as a part of the world's progress administration, created a resettlement community for 500 desperate farmers in the sunken lands. The Cash family moved there in 1935. Here I wrote this song for my grand mother Carrie Cash. She raised seven children, six to adulthood. She picked cotton. She was married to a man who was unkind. She didn't complain much. She said when they moved into this home, it was their redemption or salvation." Cash has a rich musical history. She started having a string of hit records in the 1980s that crossed musical genres. Her most commercially successful hit song was "Seven Year Ache." 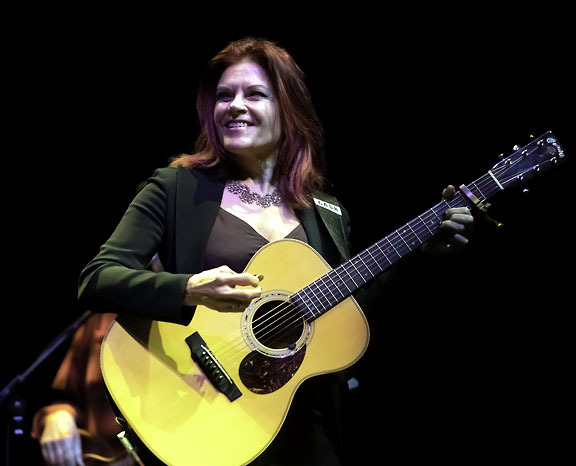 Cash has released 14 studio albums and she manages to include songs from the beginning of her career. 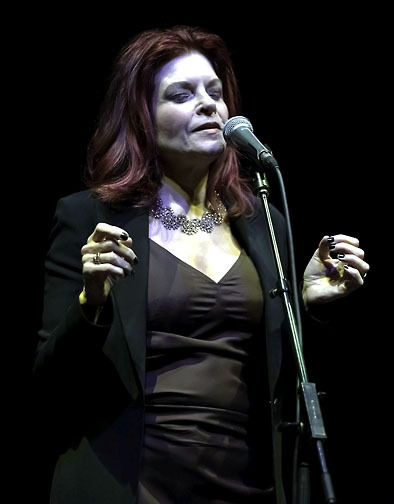 In 2014, Cash took the Grammy Award honors for Best Americana Album for The River and the Thread, Her song, "A Feather's Not a Bird" won for Best American Roots Song and Best American Roots Performance. Her album, The List, was derived from her dad giving her a handwritten list of 100 Americana songs when she was 18 years old. Her dad said, "This is your education." She performed the "centerpiece' of the list, Marijohn Wilkin's "Long Black Veil." "Ode to Billy Joe" was not on the list, but she thought it should have been. That was the next song during the performance. Also on her list is The Beatles. She did a cover of "Things We Said Today" and an extemporaneous version of "Ticket to Ride." Cash describes her new album, She Remembers Everything, "These are the most personal songs I've written in a long, long time. I'm calling them Gothic, feminine, time-travel mission statements. I figure women my age (63) still have a lot to say and less time to say it. "The Undiscovered Country" is a prime example of this statement. The song is about her truth. The continuing theme throughout the album is human mortality or the realization of her mortality. There is an ache in her voice as she delivers the anthems on the album. "Crossing to Jerusalem" is another example of this theme. Cash reflected, "What are you going to do? It's real (mortality). Might as well make art and poetry out of it. "The album is a document of her life. Even though The River and the Thread is not the new album, it holds up very well over time. The set contained five songs from the album. The songs are as mysterious as "Ode to Billy Joe." The centerpiece seemed to be "Money Road." 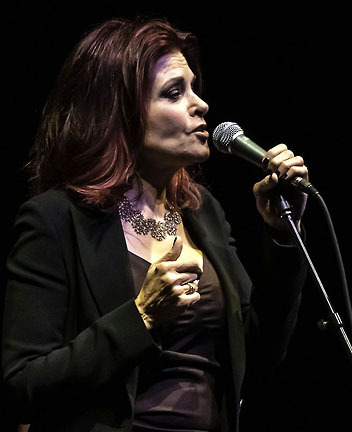 Cash introduced the song with a narrative about preparing to write the album. "These are all songs that I wrote about the dark streams of the beautiful American South that I wrote with John Leventhal. We started our trip writing The River and the Thread in Greenwood, Mississippi. We drove out this lonesome highway. To a little Zion Church where there is a grave of the father of the blues, Robert Johnson. Well, it's one of the graves of Robert Johnson. Little further down that road there is a crumbling grocery stare in Money, Mississippi that has a plaque outside that says, in 1955 14 year-old Emmett Till, a black boy from Chicago, was murdered. That event later sparked the civil rights movement because Rosa Parks said when she didn't get up from her seat on the bus she was thinking about 14 year-old Emmett Till. Right around the corner from Bryant's grocery is the Tallahatchie Bridge. You could walk from Robert Johnson's grave to Bryant's grocery to the Tallahatchie Bridge. That is just down the road from Dockery Farms where Howlin' Wolf and Charlie Patton played the blues and picked cotton. That's just down the road where B. B. King was born and raised. Just over the river is where my dad was born and raised." "You start to wonder what happened in the Delta? All that literature and music, the suffering, the beauty, the violence, the redemption, all of it makes us who we are, as Americans. So many of those things happened on Money Road." Everyone in the band is a seasoned musician who reads Cash's every move and nuance. Leventhal and Cash have been married for 24 years. He is Cash's musical director and writing partner as well as guitar player. Both make a very powerful writing team. Kevin Barry plays lap steel, pedal steel and electric guitar and played several soaring solo during the performance. Zev Katz on bass guitar kept an understated style was superb throughout the set. Dan Rieser on drums and percussion while Matt Beck rounded out the band on keyboards. Cash remarked, "It is fortunate that I still love what I do and I'm still writing songs." "All I need is the Delta and The Beatles." It is more fortunate for the fans that she still loves what she does.